Stem: trunks several to many; main branches decumbent to erect. Flower: inner perianth < 3 cm, yellow to yellow-green, generally with purple tips; filaments green. Fruit: leathery to slow-drying, proximal tubercles >> distal; base generally acute; spines 0--many. Seed: < 7 mm, generally fertile. Chromosomes: 2n=22. Habit: Plant < 3 m. Stem: terminal segments generally 16--40 cm, 1.7--4 cm diam, firmly attached; tubercle 16--35 mm, < 7 mm high. Spines: 0--20, generally < 3.5 cm, yellow to orange-brown, sheath translucent white to gold-brown. Ecology: Chaparral, pinyon/juniper woodland; Elevation: 700--1900 m. Bioregional Distribution: sw SnJV (Cuyama Valley), s SCoRO (Cuyama River Canyon), PR, w DSon; Distribution Outside California: northern Baja California. Flowering Time: Apr--Jul Note: Densely spined forms can be confused with Cylindropuntia ganderi. Citation for this treatment: Marc Baker, Bruce D. Parfitt & Jon Rebman 2014, Cylindropuntia californica var. parkeri, in Jepson Flora Project (eds.) 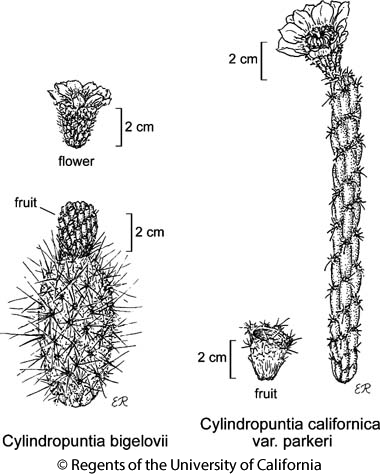 Jepson eFlora, Revision 2, http://ucjeps.berkeley.edu/eflora/eflora_display.php?tid=87443, accessed on April 21, 2019.
sw SnJV (Cuyama Valley), s SCoRO (Cuyama River Canyon), PR, w DSon; Markers link to CCH specimen records. Yellow markers indicate records that may provide evidence for eFlora range revision or may have georeferencing or identification issues. Purple markers indicate specimens collected from a garden, greenhouse, or other non-wild location.